BAKU, Azerbaijan — Lewis Hamilton needs his luck to change in Azerbaijan. Already nine points behind Sebastian Vettel, the defending champion has yet to win a race this year. Baku's emphasis on straight-line speed could favor Hamilton and Mercedes this weekend, but the British driver has struggled in both previous races held at the track. In 2016, he crashed in qualifying, while last year the seemingly trivial issue of a loose headrest forced him into the pits, where he lost valuable time. He finished fifth on both occasions. "Baku has not been a particularly great hunting ground for me," said Hamilton, who has gone six races without a win since the U.S. Grand Prix in October. "This year is going to be tough," he added. "I'm hoping I've got a car this weekend to really battle it out with Sebastian." Mercedes dominated the last four seasons but is in a three-way fight with Ferrari and Red Bull this year. Hamilton's team leads the constructors' standings. "The others have definitely stepped up. I think we've made a step forward but they've made a big leap," Hamilton said, but expressed hope Mercedes could match that pace. "It's always easier to catch up than to be a pioneer." Mercedes has been trying to better understand how to get the most pace out of the soft tires, especially in qualifying. Vettel said Mercedes remained the favorite but the differences are minuscule. 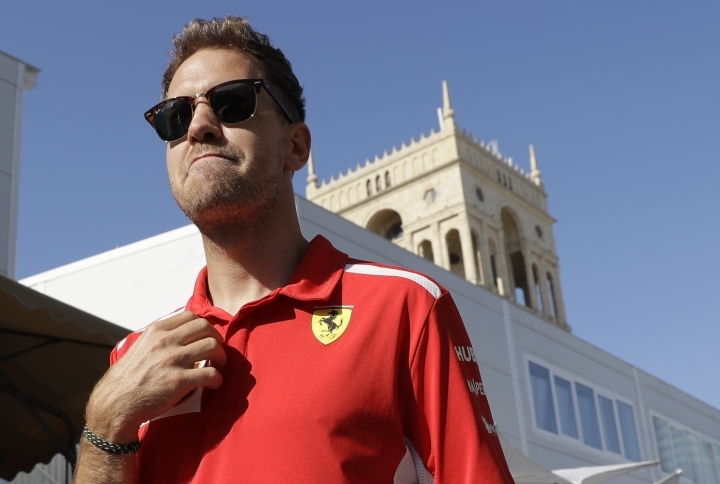 "We have three cars that are a match," Vettel said. "Whoever gets all the small issues right will be out in front." Vettel arrives in Azerbaijan as the championship leader with two wins, but needs to bounce back from finishing eighth in China after a collision with Max Verstappen. Baku's contrasting features are its long seafront straight and twisty section around the city's Old Town. That makes it crucial to find the right degree of downforce to produce enough speed but also grip in the slower corners. The track is also very narrow in places, making it likelier the race will be stopped if there is crash debris. Last year, there were two safety car periods before a red flag restart. Tempers flared, with Hamilton and Vettel making contact behind the safety car. Daniel Ricciardo, who won in Baku last year and is coming off a victory in China two weeks ago, said he wasn't yet thinking of the title and that his team needed to show it could consistently challenge Mercedes and Ferrari. That's also a factor in Ricciardo's musings about a possible move to Mercedes or Ferrari next year. "It's still early but I think we proved if we're there we can do a lot with (the car)," Ricciardo said. "Because we're not winning every weekend, when you have a sniff of a victory that's all the motivation and the hunger that I need." Besides the tendency of Verstappen to collide with his rivals, Red Bull is also struggling to match Ferrari's qualifying pace. Neither Red Bull has qualified higher than fourth in the three races so far this season. "I think Saturday we'll probably not be there, but Sunday we can turn it around," Ricciardo said. At the other end of the grid, misery continues for Williams. Nearly a year after Canadian teenager Lance Stroll earned a surprise third place in a chaotic race in Baku, Williams is well off the pace. Stroll's three 14th-place finishes are its best results so far this year and he's not expecting much improvement this weekend. Speed is crucial in Baku — and Williams doesn't have the pace. "Those long straights were our strengths last year and unfortunately a bit of a weakness this year," Stroll said. "With a really competitive and really good race, we are P14 or P13, and last year we were comfortably in the points many times."